We provide tailored makeup lessons for individuals or groups for self-application. Can also be bought as Gift Vouchers – click here to treat a loved one to the gift of beauty. Learn how to stay looking youthful – masking the signs of age – with a healthy and radiant glow every day. The power of makeup can give us a helping hand in looking fabulous with the right colours, products and techniques. Choose the most suitable lipstick colours and textures and how to achieve a naturally fuller lip appearance. You’ll pick up some great tips that will be invaluable for years to come! WHY SHOULD I BOOK A MAKEUP LESSON? Have you ever wanted to really understand which makeup styles suit you, which colours light up your face and make you look radiant and healthy? Have you ever been confused about the vast array of products available to choose from and not knowing where to begin? 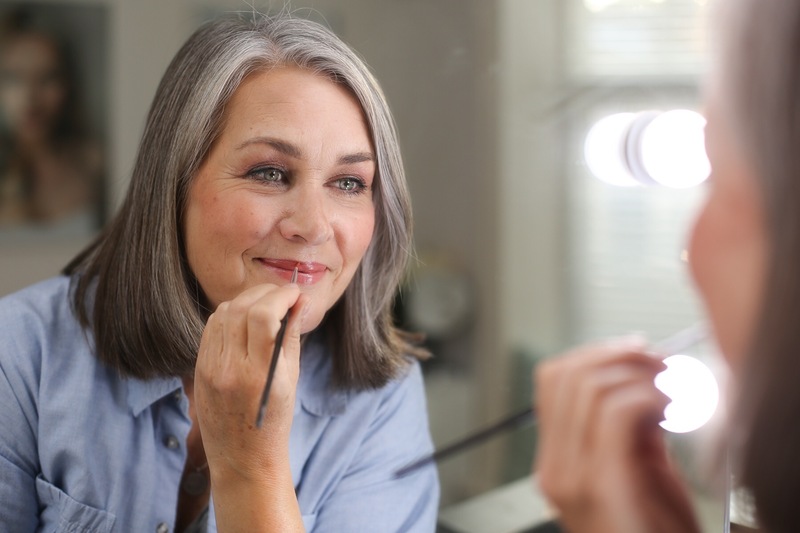 Do you feel like you’re stuck in a rut with the same makeup routine for years not knowing how to make yourself look younger, effortlessly stylish – as if you woke up looking like this? Do you use the same makeup style for daytime and evening and don’t know how to turn your daytime look into a more glamorous and sophisticated evening look? If the the answer to any or all of these is yes, then a makeup lesson is what you need. Makeup lessons are entirely bespoke and taught on either a one-to-one basis or in groups of two to three people. (Makeup parties for larger groups are also available – the perfect opportunity to update your skills with friends/sister/mum). The lessons take two hours and the content is completely customised to suit your goals and experience. We also look through your existing makeup kit (please have it with you, no matter how big or small!) to assess which products are suitable and which you might need to get. As part of the lessons we work out the most flattering colour selections for you according to the theory of “colours by season” and Kristina’s own bespoke colour assessment method. We then go through step-by-step the most flattering makeup styles for you – firstly by watching and then repeating under guidance. Learn how to look stunning every day and both polished and sophisticated on special nights out. With the basic necessary skills that you’ll pick up during the lesson and a bit of practice you’ll be able to achieve this. At the end of the lesson you’ll look amazing and wish you’d done this years ago! We work from a beautiful studio in central Richmond, Surrey which has been designed to strict specifications in terms of lighting, furniture, and space to be perfect for makeup lessons. We also provide makeup and hairstyling services from here when not travelling. Should you, however, prefer to have a lesson from a location of your choosing this can also be arranged. WHO ARE THE MAKEUP LESSONS SUITABLE FOR? Brides-to-be who will not have access to the makeup artist of their choice and want to master the application of bridal makeup for themselves. Whether you would like to learn a natural and everyday look, a style suitable for the corporate world or a glamorous and sizzling evening look we would be more than happy to guide you through the makeup maze. We will show you how to make the most of your facial features and how to enhance them with the help of correct application skills, colour matching and of course the right products. If you are planning on getting married somewhere where the makeup artist of your choice will not be readily available, we can teach you how to apply your own bridal makeup so that you will look simply stunning on the day. We use products and application techniques that ensure flawless long-lasting makeup from the morning through to the night with just an occasional lipstick touch-up required. All of our lessons include 2-3 professional portrait photographs of yourself taken at the end of the lesson to have a visual reminder of what you have learned. Start at £175 per person for a two-hour lesson at the Kristina Gasperas Makeup and Hair Studio in Richmond. Lessons may be with Kristina or a K-Team member depending upon availability. All are tailored to your specific requirements and include the professional portrait photography service mentioned above. Makeup lessons for 2 people start at £150 per person for a shared two-hour lesson at the Kristina Gasperas Makeup and Hair Studio in Richmond. £60 per hour. Available to makeup training clients or individuals just looking for advice. Involves a shopping trip with Kristina or a K-Team member on hand to help you select the best, most suitable products at stores we can recommend or your favourites. Please CONTACT US and let us know what you’d like or to book an appointment.